I want a new pattern designed by an artist I want to use an existing design I saw. 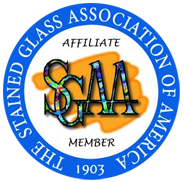 I am going to hang this stained glass so I will need hooks and hardware included Minimal Install: The stained glass rests against your existing window and is held in place by tacking, quarter round or molding. Insulated Unit: The stained glass is insulated between two pieces of tempered glass for new construction or window replacement. Construction: The stained glass is shipped and ready for construction projects with an exterior grade wood or vinyl frame.